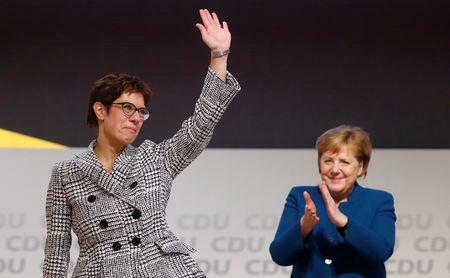 Kramp-Karrenbauer, 56, is Merkel's protege and was the continuity candidate favoured by the party elite. She won the leadership with 517 votes out of 999 votes cast by delegates. 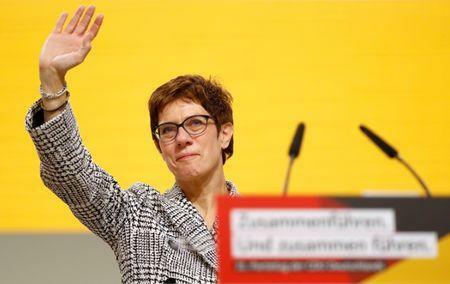 Her rival, Friedrich Merz, won 482 votes in a run-off. "Merz was just a bit too free-market, pro-American and pro-defence. Also, his pitch to the convention was wooden compared to AKK's passionate appeal. Still, he forced her into a run-off, which suggests that AKK will preside over a divided party." 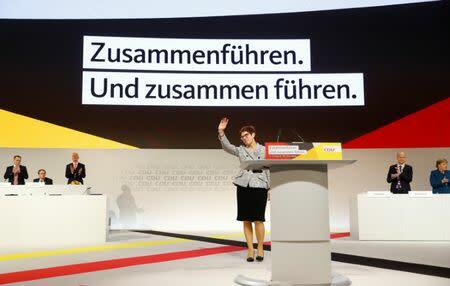 "You've got big shoes to fill," SPD leader Andrea Nahles wrote on Twitter. "Good luck! Now it's time to solve problems: shoring up the future of pensions, recognising the value of work, strengthening cohesion in Europe. I offer good teamwork." Earlier, an emotional Merkel bowed out as party leader, telling the congress: "It has been a great pleasure for me, it has been an honour."